U.S. Marines reluctantly adopt a small mare to carry ammunition in battle during the Korean War, believing she will be too weak for the job. They soon realize their mistake! Digitally colored pencil drawings capture the spirited mare and her military world in a khaki-tinted palette, while the straightforward, informative text is presented framed by various relevant documents and objects, lending the art a collagelike feel. Nicknamed Reckless, the mare has a passion for food—she loves chocolate and Coke, regularly joins the men for scrambled eggs, and even nibbles on poker chips. But it’s Reckless’ hard work that truly makes her a beloved member of the team, and after learning to cope with the noise of battle, she carries ammunition to the men through shellfire and flares, saving lives and helping win a battle that changes the course of the war. 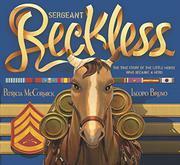 The only nonhuman to be awarded military rank—she’s promoted to sergeant and receives two Purple Hearts—Reckless is eventually brought to the States through the efforts of the soldiers who loved her. This intriguing historical tale of an underdog highlights the connection between animals and humans, provides a view of the dangers of the battlefield, and has a subtle feminist slant.